When it comes to smartphone chipsets, Qualcomm surely takes the lead with its Snapdragon processors. But, there is no doubt that every year, a lot of phones are launched with the MediaTek processors which are decent for the budget devices. Every year, MediaTek launches some chipsets in its ‘Helio P’ as well as the flagship ‘Helio X’ lineup. It was rumoured that the company would launch the Helio P40 and P70 in 2018 and today, we got the alleged specifications of both processors. Starting with the P40, it is going to be manufactured using the 12nm TSMC technology. It will be an octa-core chipset with 4x A73 clocked at 2.0GHz, and 4x A53 clocked at 2.0GHz. 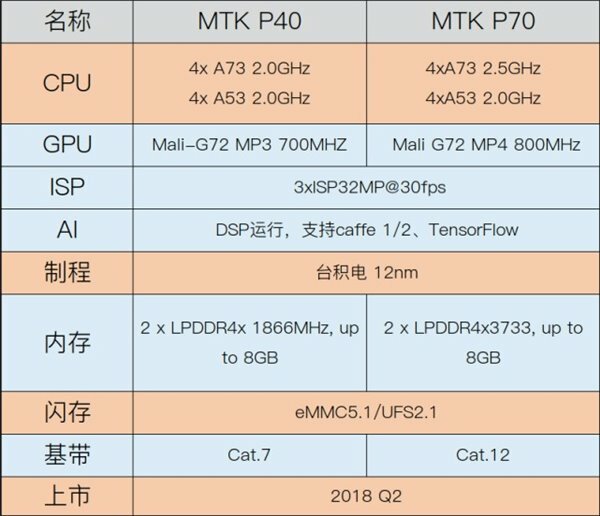 The GPU combination for the P40 is going to be the Mali-G72 MP3 GPU clocked at 700MHz. It will support up to 8GB LPDDR4x RAM and is going to feature some AI features, thanks to TensorFlow and other things. Now talking about the Helio P70, it will be manufactured with the same 12nm TSMC technology, but the clock speed is different. The chipset will feature eight cores with 4x A73 clocked at 2.5GHz, and 4x A53 clocked at 2.0GHz. There will be the Mali-G72 MP4 GPU with a clock speed of 800MHz. It will support up to 8GB LPDDR4x RAM (3733MHz). Other features include TensorFlow, CAT.12, UFS 2.1 etc. Both these chipsets will be launched in the Q2 2018. Do you think they can compete with the upcoming mid-range chipsets from Qualcomm? Do let us know via the comments section below.